Just last weekend I had the opportunity to attend a conference called Time Out for Women. I had heard of it, but had never been before. My friend told me that they would be coming to the Dallas area, so we got tickets and planned to go. Let me just tell you, I came away feeling great about myself as a woman! It is always nice, in the midst of Facebook and Pinterest and Instagram, to have the reminder that you are worth more than you think. You don’t have to be the buff mom who birthed 18 kids in the wilderness without so much as an ibuprofen, you don’t have to be the superstar seamstress, and you don’t have to be anything else besides your best self, with your own gifts and talents. There aren’t a limited number of gifts, and other people’s successes are not your failures. There are going to be days when you feel like your are breaking, and you life is bursting at the seams. This is important for growth though. When a seed is planted and watered, it’s shell cracks, and everything bursts out. This is when the roots begin to grow, and the plant sprouts up. In the midst of our stresses, our inadequacies, and our trials, we must remember that like the seed, we are in the process of becoming the greatest we can be. Most importantly, we need a perfect brightness of hope, to see past our own hardships, to see past the perceptions of what people say we “should be” and to realize what God knows we can become. There are 3 things we can do to have this hope: 1) Develop confidence in who we are, as children of God. 2) Develop faith on God’s plan for us. 3) Develop faith in Jesus Christ. The speakers at this conference were just so inspiring, so thanks for letting me to take a minute to share! I have learned and benefited so much from it, and I just want everyone to feel the way I do! It is wonderful! So about the recipe… I love the idea of making my own spice mixes (I’ve looked specifically at making Taco and Ranch seasoning) but it was always too convenient to buy the packets at the store. I didn’t have to buy extra spices, like dry buttermilk, and the packets didn’t bother me. I went to visit my mom at the end of June, though, and she made Kale chips with her homemade Taco seasoning on them. I was blown away by how awesome the seasoning was! It was better than store packets, and I knew that it was probably better for me too. Homemade seasoning generally has less salt, unless you go crazy with it, and you know it doesn’t have all the crazy preservatives in it either. Once you commit to making your own spice mixes, you can make them in bulk and then it really is just as convenient as a store-bought mix. 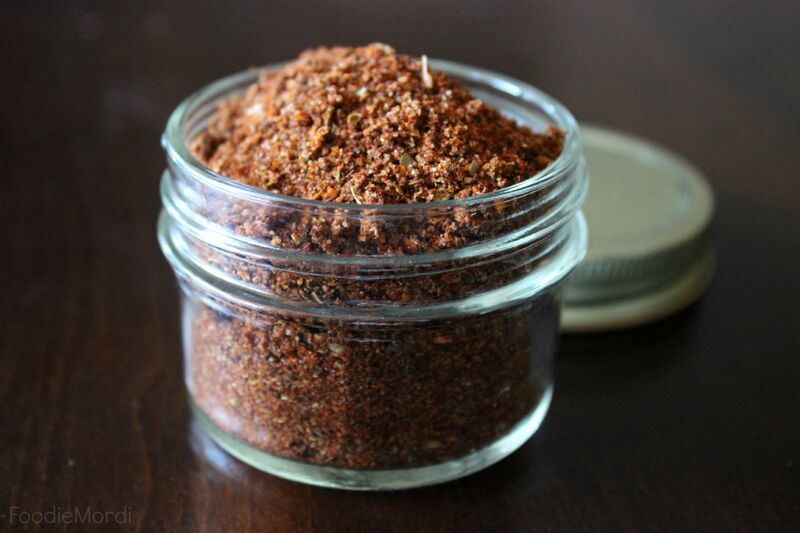 This is my mom’s recipe for Taco Seasoning, and I love using it! It is a little different than the store-bought stuff, because it doesn’t have thickeners in it (i.e. corn starch or flour). If you want a thick taco sauce then it is easy enough to add corn starch to this seasoning mix, or directly to the pot of food you are making. Combine all the spices into one mixing bowl. Stir until evenly combined, and then pour into an airtight storage container. This will make a little less than 1 cup of seasoning, so a pint Mason jar should do the trick! Love this Katherine! Now… could you also find for me a dry mix for spaghetti, chili and sloppy joes? :) Love ya!